A glimpse of India in black and white. This picture was taken at my friends farm where people are busy in building a small cattle shed. A really fine shot. Great light. lovely photo of this traditional work. Use to be that poor people had thatched roofs, but now luxury houses have them. I see this is a cattle shed. Great shot in B&W from everyday life, Rajesh! 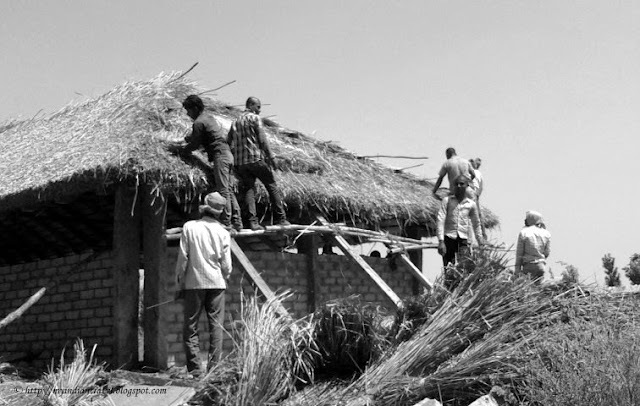 They are hard at work, I like the thatched roof. A busy day of work, interesting and dynamic view, also! sorry, but I think the photo is not sharp enough. And you can give it a bit more contrast. Men at work, good captured! Great subject for black and white. They look busy. Great shot. Interesting photo. Like it a lot! Black and white photos bring back the old India.